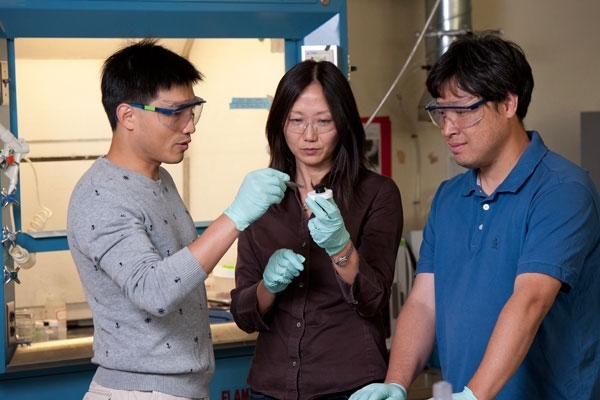 The Jell-O-like material, from the labs of Stanford professors Yi Cui and Zhenan Bao, may have applications in areas as widespread as energy storage, medical sensors and biofuel cells. Stanford researchers have invented an electrically conductive gel that is quick and easy to make, can be patterned onto surfaces with an inkjet printer and demonstrates unprecedented electrical performance. The material, created by Stanford chemical engineering Associate Professor Zhenan Bao, materials science and engineering Associate Professor Yi Cui and members of their labs, is a kind of conducting hydrogel – a jelly that feels and behaves like biological tissues, but conducts electricity like a metal or semiconductor. That combination of characteristics holds enormous promise for biological sensors and futuristic energy storage devices, but has proven difficult to manufacture until now. "There are already commercially available conducting polymers," said Bao, "but they all form a uniform film without any nanostructures." In contrast, the new gel's cross-linking makes for a complex, sponge-like structure. The hydrogel is marked with innumerable tiny pores that expand the gel's surface area, increasing the amount of charge it can hold, its ability to sense chemicals, and the rapidity of its electrical response. Still, the gel can be easily manipulated. Because the material doesn't solidify until the last step of its synthesis, it can be printed or sprayed as a liquid and turned into a gel after it's already in place – meaning that manufacturers should be able to construct intricately patterned electrodes at low cost. "You can't print Jell-O," said Cui. "But with this technique, we can print it and make it Jell-O later." The material's unusual structure also gives the gel what Cui referred to as "remarkable electronic properties." Most hydrogels are tied together by a large number of insulating molecules, reducing the material's overall ability to pass electrical current. But phytic acid is a "small-molecule dopant" – meaning that when it links polymer chains, it also lends them charge. This effect makes the hydrogel highly conductive. The gel's conductance is "among the best you can get through this kind of process," said Cui. Its capacity to hold charge is very high, and its response to applied charge is unusually fast. The substance's similarity to biological tissues, its large surface area and its electrical capabilities make it well suited for allowing biological systems to communicate with technological hardware. The researchers envision it being used in everything from medical probes and laboratory biological sensors to biofuel cells and high-energy density capacitors. "And all it's made of are commercially available ingredients thrown into a water solution," said Bao. The paper's first authors are Guihua Yu, a postdoctoral fellow in chemical engineering at Stanford, and Lijia Pan, a visiting scholar in chemical engineering from Nanjing University, China. Stanford's Precourt Institute for Energy funded the research.